HEXUS has already highlighted supplemental information that has come to light in the wake of the GeForce RTX 20 series introduction at Gamescom on 20th August. There were three AAA games that Nvidia used to highlight the possibilities that RTX On could deliver to gamers; Battlefield V, Shadow of the Tomb Raider, and Metro Exodus. RTX performance in the prior two titles have been under scrutiny in separate articles and now, via German language PCGamesHardware.de, Metro Exodus has its turn in the unsympathetic limelight. 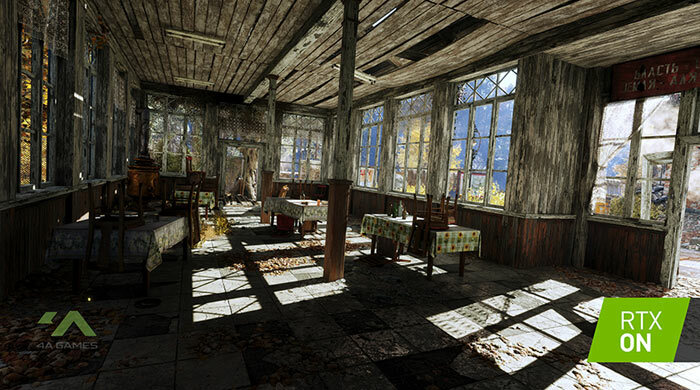 Ahead of the discussion of the third party observations of Metro Exodus I tmight be worth a visit to the GeForce Blog where Nvidia gushes “Metro Exodus enhanced with Nvidia RTX ray traced effects – see them in action in our exclusive tech video”. It claims that Ray Traced Global Illumination delivers “vastly-improved natural lighting”, and Ray Traced Ambient Occlusion adds “pixel-perfect contact shadows where objects occlude light”. The above video pays testament to the visual quality but we don’t get any official indication of basic frame rate performance and so on. PCGamesHardware.de yesterday shared its own hands on analysis from Gamecom. 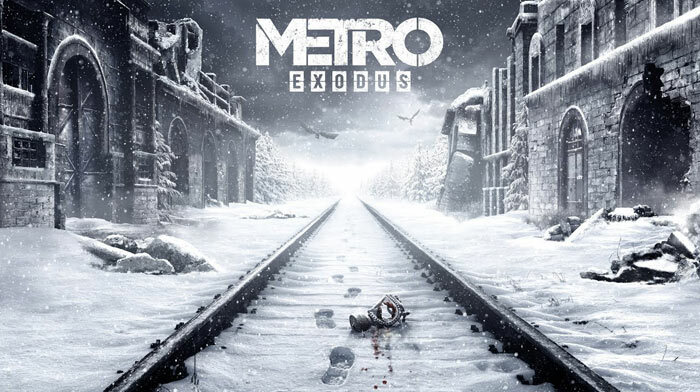 It starts by describing the game, and importantly Metro Exodus is not mostly restricted to tunnels but offers relatively open play areas. After reading the above, the observed performance of Metro Exodus with RTX On won’t surprise you. The source says that the test system with a GeForce RTX 2080 Ti was “just playable” at 40fps at 1080p. Developers have some work on their hands to achieve a desirable 60fps+ it reckons. 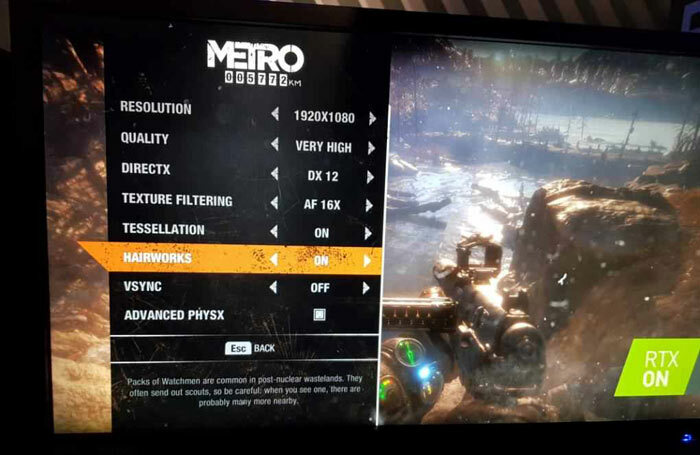 Another demo of Metro Exodus was running on a GeForce GTX 1080 Ti system (obviously no RTX) at 4K and achieved “pleasant liquid frame rates,” it is reported. PCGamesHardware.de spied inside the test systems and thinks the powerful graphics hardware was backed up by AMD Ryzen 7 2700X CPUs. Earlier today HEXUS reported on the toning down of raytracing effects in Battlefield V in order to improve realism and performance. Nvidia, doing their utmost to send PC gaming back to the stone age of sub 60 fps and 1080p. Yes and stick as much property tech in PC games so as to make my AMD rx480 unusable! Junk like hairworks and phyxs needs to die. Plenty of non-nvidia specific alternatives available that will work equally well across all cards. They'll spin it like this… people who want to spend over 1K on a single GPU now have the option to do so and won't have to worry about SLI. On top of that, their 4K gaming monitors will scale perfectly to 1080P and therefore provide the optimal experience of high frame rates on a 4K monitor. They probably will say that n'all! More on topic - this does look very nice and it's hardly surprising to see a Metro game bringing hardware to it's knees! However, I'm not sure this qualifies as ‘same as’ Physx/hairworks since DXR is part of DirectX12 - so what stops AMD supporting it? Turn RTX off and enjoy a 30% odd boost over a 1080ti, RTX is cool and all but it can be turned off and the cards will still be faster than the old gen.